Original parish records are usually stored in a county record office. These can be viewed by the public, but the archivists are reluctant to allow handling of these old and unique books. This book contains pre 1832 parish boundary maps, 1834 county maps and details of how to locate both original records and copies of them. The coverage of the IGI is also given. 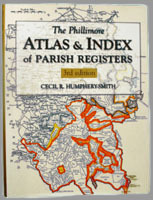 A great resource for all those looking for locations of old parishes and where the records are located. This product is available from S&N Genealogy Supplies.